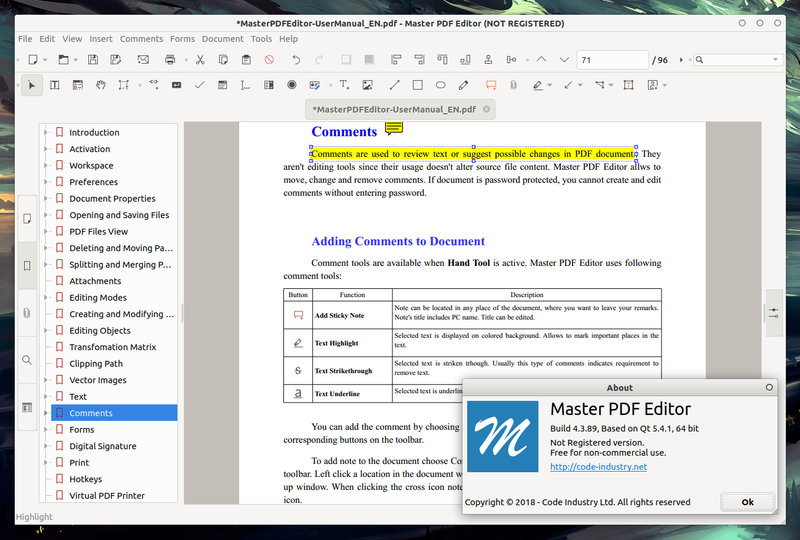 Master PDF Editor is a proprietary application to edit PDF documents on Linux, Windows and macOS. It can create, edit (insert text or images), annotate, view, encrypt, and sign PDF documents. 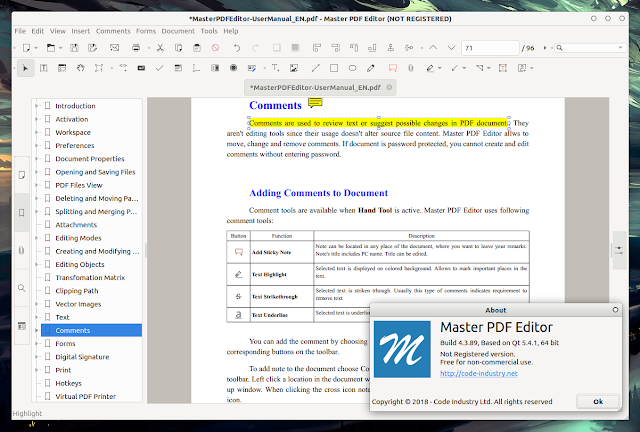 With version version 5, Master PDF Editor has removed some features from its free to use version, like editing or adding text, inserting images, and more - when using such tools, the application adds a big watermark to the PDF document unless users buy the full version (around $83). Master PDF Editor 4 though, which is free for non-commercial use with no restrictions (at least on Linux, I'm not sure about macOS and Windows), can still be downloaded and works well, even though it's not linked on the application official website. Encrypt PDF filesIn most cases you should download the Qt5 version. The Qt4 version of Master PDF Editor is for very old Linux distributions. The application may also be used as a PDF viewer (it opens PDFs in tabs), but that's probably not something most of you care about since it's the Master PDF Editor editing capabilities that makes this application very useful. Below you'll find Master PDF Editor 4 (4.3.89) download links for Linux, with RPM packages for Fedora, openSUSE, etc., DEB packages for Debian, Ubuntu, Linux Mint and so on, and a .tar.gz archive that should allow running Master PDF Editor on other Linux distributions. In most cases you should download the Qt5 version. The Qt4 version of Master PDF Editor is for very old Linux distributions. It's also worth noting that for the Qt4 64bit version I could only find the generic binary download link. In case your Linux distribution doesn't use DEB or RPM packages and you have to use the .tar.gz, make sure to install qt5-base and qt5-svg, which are required by Master PDF Editor.